We ran into a huge issue recently… At about 9PM on a Friday night our primary MySQL database began slowing to a crawl. This is an extremely slow time of day for our web application so we were all quite confused. All of our tables live on a pretty beefy SAN and everything checked out clear there. Lone behold, the Battery on our Dell Controller (PERC H700 Integrated) decided that it was time to re-learn its battery cycle. It turns out that this re-learning task happens by default on Dell servers every 90 days. While our Data didn’t reside on local disk, our binlogs did. This was apparently enough to bring MySQL to a crawl. The only way to change the behavior permanently is in the BIOS of the controller, there we can set it to only warn us that it needs to be checked. 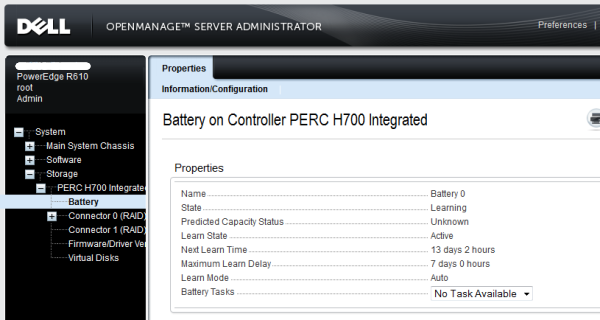 We can use some of Dell’s Open Manage tools to get more information on the status of the battery. The last command here forces write back cache even if battery is not available. 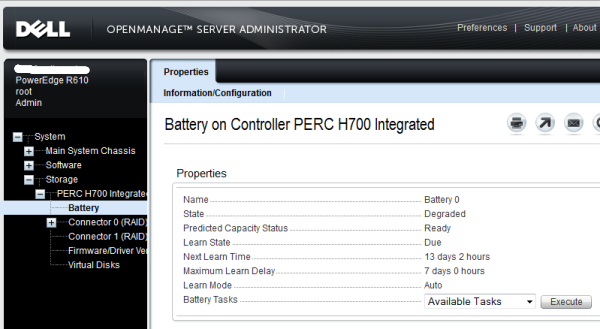 If you’re not much of a command guru, using Dell’s Open Manage GUI can also show you the status. This entry was posted in Misc. Tech by Joe. Bookmark the permalink.